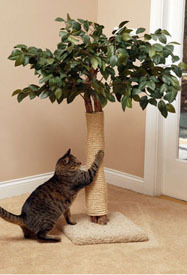 Choosing a Cat Scratching Post? Your Kitty and your Furniture will Thank You! Buying a cat scratching post allows your kitty to fulfil their feline instincts to scratch, while protecting your valuable home furniture! Cats need to scratch regularly to keep their claws in tip top condition. It helps to remove the old outer layer of the claw and stop them from over growing. So for your kitty it's like having a manicure and is a normal and natural part of being a cat! There is an almost endless variety of scratching posts available these days. So to help you decide which one your cat would like the best, I thought I would write this useful summary. If you have a cool and contemporary home interior then you might feel that the typical rope covered log that most scratching posts are like, might not look good in your home! But these days you can find some great modern and funky looking designs such as the ones I have discovered here. I think these are perfect for the more fashionable feline home. So if you appreciate the chic designer look, then a modern and stylish scratching post like this might suit your trendy apartment or condo much better. Designs like these are great if you find your kitty keeps scratching a particular piece of furniture. The corner of your favourite chair or sofa is the most likely place to suffer! 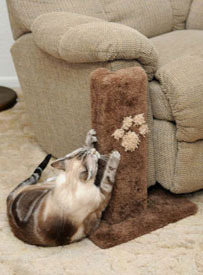 You can now buy a scratching post that fits around the corner of your chair. This way your furniture is protected from being shredded, which could cost you a fortune to replace or repair! They are also great space savers as the scratching post isn't taking up space in the middle of the room somewhere. Just think - no more shredded sofa covers or ugly scratched chair legs for you! How about bringing a bit of the great outdoors into your home? 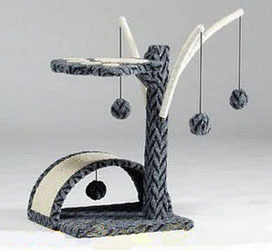 Rrealistic and natural looking cat trees and scratching post like the ones here can really help to stimulate and excite your kitty. 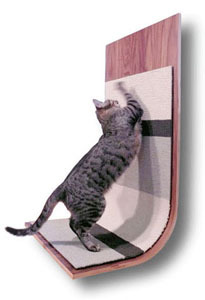 Some are made out of real cedar wood which your kitty will enjoy scratching as they can smell the natural woody scent. Others come looking like actual trees with silk leaves that will move and rustle when your kitty scratches and plays with it, adding to their excitement even more. Many scratching posts are very multi-functional. They can come as part of larger cat towers with perching platforms, places to climb and lots of toys attached to play with and explore. These are great to help keep your kitty entertained while indoors, as well as allowing them to express their natural instinct to scratch. So why not give your kitty a chance for some fun and exercise, at the same time as wearing down those claws, with one of these great cat scratching posts with toys and more! So I hope you have enjoyed finding out about the different types of cat scratching post you can buy today. There are lots more designs available here but make sure you choose a good quality item that your kitty will enjoy and that you will be happy to have in your home. That way you will be giving years of pleasure to both you and your cat!